Bitcasino.io, the world’s first licensed Bitcoin casino, has just finished with an overhaul of its site and platform to introduce some modern changes that allow for a better and faster playing experience. Besides the theme, which left out the simple jet black graphics and replaced them with a more eye-catching purple, the casino now also features new tools for its players, better access to important menus, more games, as well as a brand new logo. 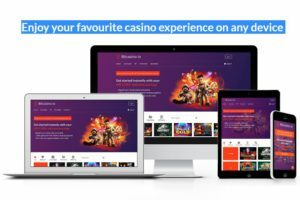 With the idea of simplifying things, the casino had started with revamping the Promotions hub which now features a clearer layout with large promo banners for the bonuses and promotions. The new site was also optimized to adapt to any screen size, which means you can now enjoy a better time regardless if you’re playing on your desktop or at Bitcasino’s mobile casino. While re-modeling the site, the design staff has also focused on improving the process of finding games, which can get particularly overwhelming considering the site features more than 1,300 games in its portfolio. That’s why you can now find new quick-access tools to help you get to your favorites more easily, as well as a shortcut to any games you’ve recently played. Namely, among the tools introduced in the new platform is a new notification icon, which pops up in the right hand corner as a bell symbol whenever there’s news related to your player account or a promotion update. Getting to your banking menu has also been made easier, as all you’d have to do now is click/tap your balance in the top right corner to access the deposits / withdrawals pages. As for the shortcuts, there’s a new clock icon on the bottom left, which can take you to your recently played games as well as a new heart icon for the favorites. And finally, the casino has also added new live dealer games, which are now powered by 6 different software providers that offer over 20 game variations and 100 different tables to players at the casino. And to help you track your bonuses more easily, the casino has also added a bonus bar next to your user name. Although the look and navigation of the site has changed, what hasn’t been changed are the generous bonus offers. Namely, the casino still welcomes all new players with a first deposit bonus of 100% match of up to 1,000mBTC, i.e. 1BTC. The bonus can be claimed without using any bonus code and is subject to only 35x wagering requirements on the bonus money only. And when you spend your first deposit bonus, you will also be able to claim a second deposit bonus of 50% match of up to 1BTC again, subject to the same wagering requirements, but also up to 5 reload bonuses a day of 25%, which are subject to even lower playthrough requirements of 30x. Even if you don’t like bonuses you can find hundreds of games to spend your Bitcoins on, including ones from popular providers like NetEnt, Betsoft, Pragmatic Play, Quickfire and Evolution Gaming, among others. But if you like to see what’s on offer personally, feel free to visit Bitcasino.io.